Explanation: Sometimes land and sky are both busy and beautiful. The landscape pictured in the foreground encompasses Bryce Canyon in Utah, USA, famous for its many interesting rock structures eroded over millions of years. The skyscape above, photogenic in its own right, encompasses the arching central disk of our Milky Way Galaxy, streaks that include three passing airplanes and at least four Eta Aquariid meteors, and bright stars that include the Summer Triangle. 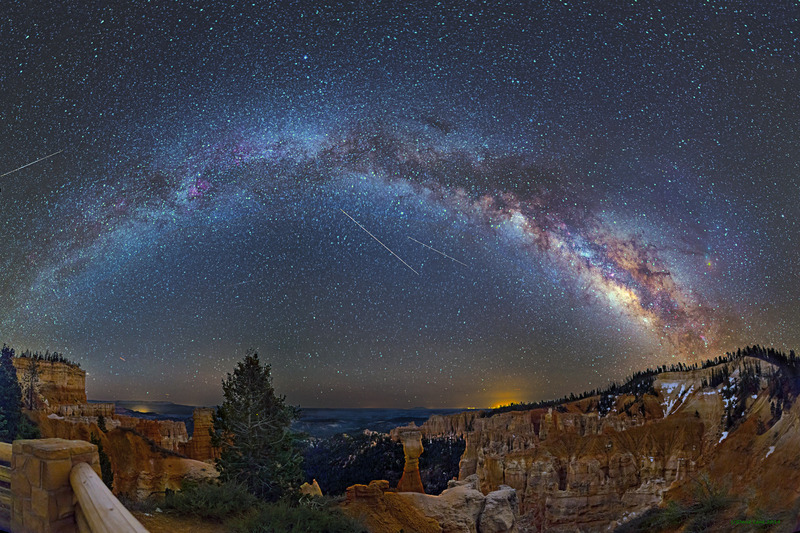 The above image is a digital panorama created from 12 smaller images earlier this month on the night May 6. If you missed the recent Eta Aquariids meteor shower though, don't fret -- you may get an unexpected reprieve. Sky enthusiasts are waiting to see if a new meteor shower develops in the early morning hours of Saturday, May 24, when the Earth moves through a possibly dense cloud of dust and debris ejected by Comet 209P/LINEAR.